Customer satisfaction is our number one priority, and we work with each of our customers from start to finish until their concerns are answered. We regret to hear that you remain unsatisfied, and assure you that we take matters such as these very seriously. We’ll further review your request, and we’ll be in touch with you shortly to continue working on a resolution. I have attached a before and after of one areas that was repaired/fixed by the very unprofessional installation. Looks worse now than before the fix. 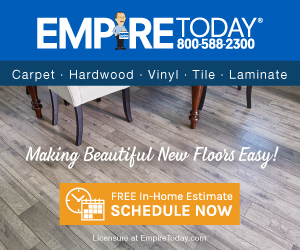 I do not want Empire Today back to replace the flooring, I want my bill reduced so I can hire professionals to paint and repair the damage caused by the installation and re-do. Now I have been receiving collection phone calls from Empire Today. This has been a nightmare. I have had several contractors from Empire Today look at the installation, I have repeatably asked that the original contractor not return. But he returned and reluctantly replaced the shoddy work he did from the beginning. I believe it is the luck of the draw when you hire Empire Today. If they send a good contractor you get a professional installation. I hope this is resolved soon. So many contractors have been sent to fix this unprofessional installation and it is still an unprofessional installation. I have been in communication with the complaint department but this is still not resolved. The last offer, which was very generous, wants to send another crew and install another new floor. I have rejected this offer, I want my balance to be reduced and for them to put on strip of quarter round to cover up a very badly cut vinyl. Now I am being threatened with collections.Where do go from here? Empire Today was responsive, but not quickly and I had to wait for a 4 hour window more than once. One time they did not show up at all. It has not been completed yet but some repairs have been done by a professional. I am requesting that they balance of my bill be reduced and that one more quarter round be installed to cover up the uneven/shoddy cutting of the vinyl at installation. Empire Today offered to pay for the repair to the baseboard with 3 estimates from licensed painting contractors. I was not able to find a contractor that would only paint small areas. My problem is that it should have been right the first time. After many emails and photos the original installers returned. I had requested that they not return several times. I had said from the beginning if they thought the installation was done correctly I did not want them back. But that did not matter. The installers were argumentative and even suggested we call someone else to fix it and bill Empire Today. They reluctantly did the work they were sent out to do. They removed some of the white caulking and replaced some of the qtr. Leaving white caulking and covering it with clear did not work and mitering should have been done at the corners. So it looks better but it is still unprofessional. They also did not take any responsibility for damage at installation. Tiles were knocked loose and fell off later and chips in the baseboard were new. They did remove the cement from the walls and the door. I had vinyl installed and it came in one big roll that was difficult to move around, this is why there was other damage. Here are the photos after it was fixed. Reason of review: Poor workmanship. Review #1112105 is a subjective opinion of toniburke.